A new-generation nano-platform capable of capturing circulating tumor cells and releasing them at reduced temperature. A device based on bionanotechnology has been developed that can capture and release cancer tumor cells present in the blood stream. Nanobiotechnology is the combination of nanotechnology and biology. It is also known as bionanotechnology and nanobiology (all these terms are interchangeable). The main application of this technology centers around the biological, medical, and the clinical. These applications fall under four fields of biomedical applications. These are for diagnosis, molecular imaging, regenerative medicine, and drug delivery. The main product of this technology is the nanobiodevice. This device is used to apply biological processes and procedures in areas where these systems are not naturally inherent or damaged. An example of a nanobiodevice is a recently developed drug delivery system that identifies stroke causing plaque in the blood stream and releases chemicals to dissolve them. Nanobiodevices have lots of potential since it does not require any intrusive procedures such as surgery. Most are introduced to the body through oral medication or via hypodermic needle injections. An emerging application for this technology is in the treatment and therapy of cancer. There already biodevices developed that can identify cancer cells in the body and are programmed to take appropriate action such as identification or even treatment. Scientists from the RIKEN Advanced Science Institute in Japan and University of California Los Angeles report a new nanoscale Velcro-like device that captures and releases tumor cells that have broken away from primary tumors and are circulating in the bloodstream.This new nanotechnology could be used for cancer diagnosis and give insight into the mechanisms of how cancer spreads throughout the body. The device provides a convenient and non-invasive alternative to biopsy, the current method for diagnosis of metastatic cancer. It could enable doctors to detect tumor cells that circulate in cancer patients' blood well before they subsequently colonize as tumors in other organs. The device also enables researchers to keep the tumor cells alive and subsequently study them. Video: What is Metastatic Cancer? The device was developed by a team led by Hsiao-hua Yu from the RIKEN Advanced Science Institute in Japan and Hsian-Rong Tseng from the Department of Molecular and Medical Pharmacology at the University of California Los Angeles, in research published online today in the journal Advanced Materials. Similar cell-capture devices have been reported but this technology is unique in that it is capable of catching the tumor cells with great efficiency and releasing them with great cell viability. Blood is passed through the device like a filter that contains a molecule capable of adhering to tumor cells like Velcro and separating them with efficiency ranging from 40% to 70%. 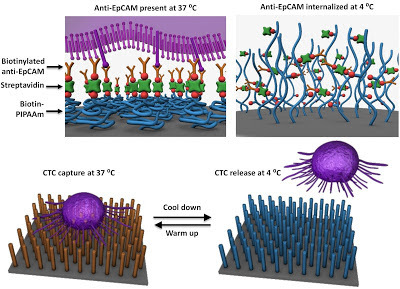 The cancer cells are retained by tiny temperature-responsive polymer brushes inside the device. At 37 degrees Celsius, these polymer brushes stick to the tumor cells, but when cooled to 4 degrees Celsius, they release them, allowing scientists to examine the cells. "Until now, most devices have demonstrated the ability to capture circulating tumor cells with high efficiency. However, it is equally important to release these captured cells, to preserve and study them in order to obtain insightful information about them. This is the big difference with our device." Explains Hsiao-hua Yu, who led the team that developed the technique to coat the device with polymer brushes.